Operating a power plant or ship is a great responsibility and is especially difficult in remote locations. Efficient operation needs reliable equipment, trained staff and the highest attention to quality control during daily operation. The fuel and lubricating oil form a major cost element in the operation of every power plant and the quality must be closely monitored. An increasing number of customers are seeing the financial logic of spending less on repairs and downtime and are investing in preventative maintenance, quality control and training. The Power Plant Laboratory forms a key part of that support strategy, providing for constant quality control of the fuel and lubricating oil. Analysis of the fuel oil requires a representative sample of the delivery, labelled and stored correctly for future reference. 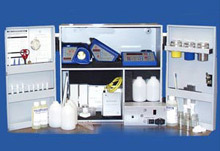 Fuel samplers, documentation, sample storage and shipping systems are provided as an integral part of the laboratory. Monitoring lube oils can be undertaken in the field and by using a laboratory based analysis service. The Power Plant Laboratory provides instant and accurate results for a limited number of physical oil parameters. Results from the laboratory can be recorded on site using special software and tests can be compared against previous readings to provide trends and trigger warnings. Machinery ID, oil hours, maintenance findings and recommended actions etc are all tagged for future reference against individual test results.